One family tradition we have in the summer is our “cocktail hour”, where we try to create some delicious, cold drinks on hot summer days. This is partially to have some connection time in the afternoons, and partially to fight off the nearly inevitable question of “can’t we get a slushy?”. Yeah, no, we don’t need that. My kids love frosted lemonade or limeade, or a non-alcoholic margarita, but with type 1 diabetes in the family, I’m always monitoring the carb and sugar intake in our drinks. Recently, we have discovered flavoured club soda and sparkling water. So delicious! We keep some of these in the office too, as they are a tasty drink without calories for the afternoon. and limes – we did this one in the office for Cinco de mayo. Have you tried the newer flavoured club soda or sparkling water beverages? We’d love to hear about your drink creations in the comments! I love sparkling water and fresh citrus – and making it myself with my SodaStream! My tip is: weekly slice up your favorite citrus fruits, put in a freezer bag and freeze! Keeps your sparkling water cold and refreshing! 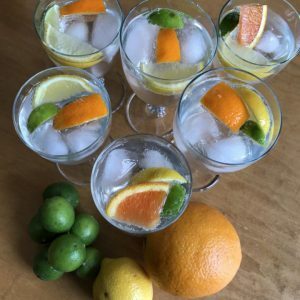 I’ve been trying to find a good recipe for homemade club soda – any ideas? I like that extra tang, but would rather make it myself.